It's been said that Boyhood Island is "the most Proustian" of Karl Ove Knausgaard's My Struggle series, and while this is true that both Proust and Knausgaard present intense remembrances of childhood, the same could be said of many other novels, for example Tomas Bennerhed's The Ravens, recently published by the Clerkenwell Press and, like Boyhood Island, a novel of a 1970s childhood set in Scandinavia. Both Proust's and Knausgaard's would surely be lost among them were it not for what sets them apart. What sets them apart might best be summarised as the lingering uncertainty of their status as novels. For all the differences between the authors that are finally destructive to the casual comparison, there is a common pressure exerted by the formal quality of each narrative voice: an essayistic spirit set within a distinct, first-person predicament refusing the comfortable distance of the knowing third person and, because of that, demanding that the reader participates in the questing nature of the narration. While the Overture to In Search of Lost Time emerges from the uncertain place between dreaming and wakefulness, Boyhood Island merely introduces a discussion of the status of childhood memory. After a traditional family scene of moving into a new house on a Norwegian island narrated with objective confidence, Knausgaard interrupts the nostalgic flow and admits that he doesn't remember any of it himself: the action and dialogue are inventions based on family legend. As the distance is made explicit, there is no blurring of generic edges. This is certainly a truism yet, placed before a narrative explicitly based on the author's own life, it introduces anxiety to the mournful dejection that personal memories invariably provoke, making what proceeds less an indulgence than a nervous exploration of what remains. As a writer then, Knausgaard, like Proust, must navigate a path between the total freedom offered by the constraints of genre – amply demonstrated by Tomas Bennerhed's reliance on heavily descriptive prose to dissemble its lack of truth and necessity – and the silence of terminal uncertainty. It is here that Knausgaard retreats from Marcel's quest to recover the living presence of the past and instead sticks to a straightforward narration of everyday life. There are only two, brief, vertiginous diversions that resemble anything like those in the first two volumes and what elevates them beyond fictionalised memoir, and, as a result, the sly and artful come to the fore. He writes that young Karl Ove took great pleasure in not defecating when he felt the need, sticking his fingers up his backside to smell what he held back, which means we have the author of a six-part autobiographical work reporting that he was anally retentive as a child! He then enjoyed the relief of letting go, a feeling perhaps similar to completing the sixth and final volume of My Struggle. Moreover, he is told off by his teacher for revealing in class the reasons for a classmate's broken home and is told that he should learn some social decorum. Are these anecdotal precursors of later life too good to be true? Sometimes it seems that way, especially as much less trivial events are later pushed toward the void. the difference between the freedom outside and the prison-like state inside, and how the latter very slowly influences the former, and in the end changes it fundamentally. Another word for that would be integration, I think. The eye of God ends up inside, so that, in the end, you take care of judgment and punishment yourself. Perhaps a supplication to greater powers sums up the reckoning with the past and present that the book sequence displays and why it began with the death of his father. However, in Time Regained, the adult Marcel takes the Méséglise Way again and discovers it is in fact physically linked to the Guermantes Way; there wasn't such a profound opposition and, in revising his assumptions, makes him more aware of continuities and possibilities for revising ongoing assumptions. The proximity of separate paths turns out to be true of Karl Ove's paths too, leading us to a better comparison than with Proust's novel – that of Kafka and his father, or, more specifically, George Bendemann and his father. The Judgment begins with Georg's self-assurance that he can write about his life to his friend in Russia without worrying too much about the consequences. Writing is freedom. But this is soon ended by his father when he reveals that the Russian friend knows all about Georg's self-serving behaviour because he, the father, has been in contact with him all along. Georg's suicide then is a submission to the power that reveals itself to be present in writing too. His suicide is the murder of writing by means of writing. Compare this with Karl Ove's actions as his family prepares to leave the island idyll. The teenager finds himself out of God's sight and, at a school camp, he and other boys pursue girls and behave in ways that readers will have to read and judge for themselves, if indeed they notice it all, so cursory is the description. Collusion with other boys is significant here because it dilutes responsibility, allowing the brute instincts of teenagers to stand in for the 'suicide' of the oppressed little Karl Ove; these girls disappear into the distance like a roadkill in a rearview mirror. Writing is as pragmatic as memory. I guess I have a talent for humiliation, a place within me that experience can’t reach, which is terrible in real life, but something that comes in handy in writing. It seems as though humiliation has become a career for me. 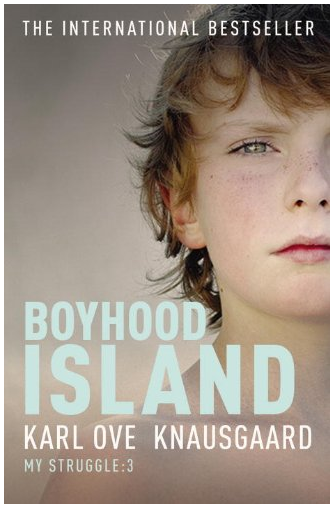 Behind this confession is perhaps what is most disturbing about Boyhood Island: the possibility that father's tyranny is growing in the little boy even as he appears to resist it, or, to be less personal and less judgmental, the manifestation of the manipulative power that secretes itself within even the most open, honest, self-abasing act.